Crafting captivating music that not only thrives on contemplating important societal messages, but also specifically supports the authentic expression of women’s voices, isn’t always a simple process. But Canadian-born singer-songwriter-guitarist, Sherri Anne, who’s the leader of the Los Angeles/Vancouver-based band, Sister Speak, effortlessly crafted an electrifying group of new songs with her bandmates for their upcoming EP, ‘The Stand.’ The six-track indie-pop-rock album, which is set to be released on September 27, is driven by heartfelt arrangements that explore the important idea of maintaining personal freedom, especially for women. 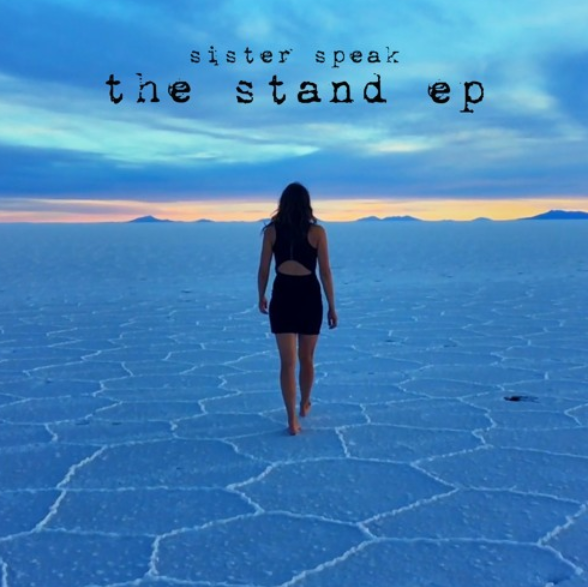 ‘The Stand’ immediately proves to be one of the year’s best blues-folk-electronic records with its endless inspirational lyrics that are set against uplifting acoustic arrangements. The EP begins with one of its most outstanding entries, ‘New York Sunrise,’ which is driven by a flowing mix of sentimental piano keys. Sherri Anne beautifully croons that she stays up all night admiring the sunrises in the title city, as she doesn’t want to close her eyes on the rising of new opportunities. As the singer also proclaims that she’ll be strong enough to stand up during even the most painful experiences, she immediately proves that her talent rivals such powerful singers as Evanescence’s Amy Lee. ‘New York Sunrise’ then delves into ‘The Stand’s sophomore effort, ‘Fighter.’ The innovative and uplifting song, which continues to capture the essence of Lee and her Grammy Award-winning rock group, has the potential to become a genuine commercial radio hit for Sister Speak. Driven by an eclectic mix of the piano, guitar and drums, the track features Sherri Anne singing about how she’s keeping a seemingly positive public demeanor, even though she’s really experiencing diverse emotions in her heart and mind. Like its predecessor, the album’s second tune proves that with never-ending persistence, Sherri Anne can overcome any struggle she faces. Another noteworthy and memorable entry on Sister Speak’s new record is ‘Do You Believe,’ which creatively takes on a lighter instrumentation, especially with the piano chords and guitar riffs. Sherri Anne emotionally chronicles how the person she was involved with thinks she doesn’t miss him, but she does still remember how he looked at her. She’s left to reflect on their strong bond on her own, which is naturally showcased in the singer’s vocals. The emotionally intense vibe also notes that the two did truly ponder their relationship, but they eventually realized that they may not be able to continue being together. The next effort on ‘The Stand’ is its title track, which is serving as the EP’s first single. While the song isn’t as memorable as its predecessors, the blues-inspired guitar and relatable lyrics that Sherri Anne stunningly delivers help highlight her and her bandmates’ musical versatility. The singer powerfully croons that despite being caught up in a moment, she must do whatever it takes to stand her ground and defend her freedom.